Sources: Compiled from China National Bureau of Statistics and China National Coal Association statistical releases by RenewEconomy. We’re used to reporting year after year how China’s coal consumption is increasing and how they are polluting more and more. But this is the first year in over 2 decades when the number hasn’t increased. Could China’s coal boom be over? While positive signs have been emerging from China for well over a year, it appears the ‘war on pollution‘ is not just talk. To make things even more interesting, even though the coal consumption didn’t rise any more, the GDP continued to grow (though slower) – that means that coal consumption and GDP appear to have finally decoupled. The growth of coal imports (mostly from the US) almost stopped, staying at a meager 0.9%, and domestic production dropped by 1.8% – and it’ hard to underestimate just how historic this may be: China’s coal consumption may have finally peaked! While most analysts were putting Chinese peak coal somewhere around 2020, and others shouted out that China would double its coal consumption by 2030, the Asian country has surprised us again, highlighting once more just how little Western culture understands about China. China’s coal consumption will not grow indefinitely, and while it’s still unclear how fast it will start to drop, it seems pretty obvious that it will do so in the near future. There are two main competing theories which explain this evolution. 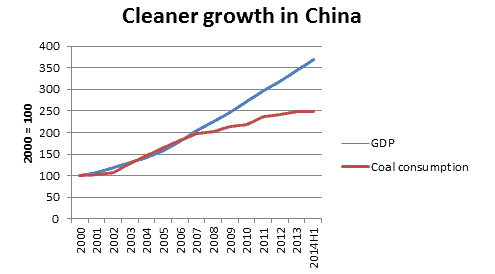 The first is that China’s economy is just slowing down, and coal consumption will continue to grow as it rebounds. The problem with this is that while for the first part of the 21st century we witnessed coal consumption and economic growth have basically a similar evolution, in past years there has been a significant decoupling of the two. This means that coal and the economy are not as tightly bonded as they used to be in China. The second theory, offered by Bloomberg is also pretty flawed: it claims that the rise in hydro power is responsible for the drop in coal usage. But this increase in hydropower was only capable of changing the coal consumption growth rate by less than one percentage point, which hardly changes the big picture. It seems clear that China is entering a new age. They seem to finally start to stray away from their fossil fuel intensive industry, and move onto different type of investments – especially in services. If they also do decide to back their words up and shift the economy towards renewable, clean energy, then I believe the next generation will be living alongside a very different China.